Food Secure Canada and the J.W. 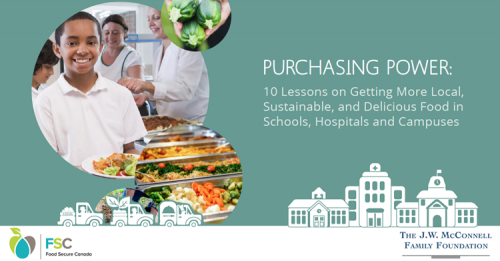 McConnell Family Foundation are jointly releasing the report Purchasing Power: 10 Lessons on Getting More Local, Sustainable, and Delicious Food in Schools, Hospitals and Campuses. The lessons profile what we’ve learned about how to shift institutional food purchasing to sustainability–from defining local, to leveraging contracts, to building food cultures, to policy change–and what the opportunities are for scaling this work. This report is timely with the announcement of the 2017 Federal Budget which prioritizes procurement opportunities for small vendors as a way to foster innovation and support the growth of Canadian businesses, and the Barton Report which has identified agriculture as a key growth sector. We cannot afford any longer to overlook the opportunity to leverage the food purchasing power of schools, hospitals and campuses to stimulate innovation and long-term growth of the Canadian economy, and benefit our health. Although national data has not been compiled, as a benchmark the Greenbelt Fund estimates that public sector spend on food was $745 million in 2016 in Ontario alone. “Often there are cost-neutral ways to start purchasing local and sustainable food. This can include measures to cut waste, purchase directly from farmers and fishers, or simply identify local products in existing supply chains.” Beth Hunter, Program Director, J.W. McConnell Family Foundation. In particular, local, sustainable food purchasing can help healthcare institutions more fully achieve their missions. Growing rates of diet-related disease are putting increasing pressure on health care and yet there is often very little fresh, local, sustainable food available in healthcare facilities for patients, families or staff. How do institutions buy food? Who are the decision-makers? What are the systemic barriers for local food?